Stewardship of God’s Creation: Claggett is a responsible steward of all of God’s gifts in order to benefit this generation and the next. The Facilities & Maintenance Director shall further the Claggett Center through the stewardship of the Claggett buildings and grounds by providing leadership, executing preventive maintenance and capital improvements, and maintaining grounds and equipment. Assist with the development and monitoring of the maintenance budget. Manage project, staff, and equipment expenses, and keep financial records for department spending. Ensure the safety of the maintenance department and facilities for workplace and guest use by maintaining working knowledge of industry standards regarding safety and security. Monitor all relevant legal and regulatory compliance. Oversee and participate in day to day preventative maintenance and capital improvements. Manage and complete “in-house” projects involving carpentry, painting, plumbing, HVAC, and electrical trades in a workmanlike manner. Position provides a competitive salary commensurate with experience. This full-time, permanent position includes the following fringe benefits: defined contribution retirement program with employer matching; health and dental coverage, including flexible spending account; paid vacation, personal days, sick leave, and holidays. The Housekeeping Director shall further the mission of the Claggett Center through the leadership and execution of cleaning, conditioning, and preparing the property for guest use. Ensure and maintain cleanliness, service, and product quality standards of guest rooms, public spaces, restrooms, offices and banquet/meeting/conference rooms in accordance with federal, local and company health, sanitation and safety standards. Lead, direct and administer all Housekeeping operations to include, but not limited to, of systems use and management, budgeting and forecasting, inventory control, department management, policy and procedure implementation and enforcement, and meeting participation and facilitation. Recruit, interview and train team members. Monitor and develop team member performance to include, but not limited to, providing supervision and professional development, scheduling, and conducting evaluations. Clean guest rooms, including, but not limited to, making beds, cleaning bathrooms, dusting and vacuuming. Three or more years of Hotel Housekeeping Management experience with a similar size property is required. The Housekeeper is part of a team, led by the Housekeeping Director, that takes primary responsibility to ensure that all of the guest spaces are kept clean. Housekeepers perform a variety of housekeeping services to maintain clean guest rooms according to established standards. Hours: Hours are variable, depending fully on guest schedules. The work will be a combination of midweek and weekend shifts. Shifts are typically 7:00 AM - 3:00 PM or 10:00 AM - 4:00 PM but vary some from week to week. Compensation: Starting at $14hr - Hourly Rate is commensurate with experience, particularly commercial cleaning, janitorial, or housekeeping job experience. Hold high standards in cleanliness of various spaces. Work either in a team or independently. Bend, lift, reach, push, carry and sustain repetitive motions. Stand, walk, climb steps and work on their feet for extended periods of time. Work efficiently, moving from one task to the next with minimal wasted effort. Exhibit a friendly and hospitable attitude to all guests and staff, even when tired. Follow instructions and yet be able to assess the situation and discern what is needed. Comfortable working in a faith-based community. Approach work with a flexible attitude. Have an ability to switch tasks with changing demands without experiencing undue stress or frustration. Must be self-motivated and punctual. Perform other reasonable job duties as requested by supervisor. Contact jobs@claggettcenter.org for more information. The candidate must be proficient in all around cooking skills, including, but not limited to: saute, frying, baking, roasting, braising, competent and safe knife skills, cleanliness, following recipes, creativity. The Cook is primarily responsible for food preparation and execution of meals served in the dining facility in accordance with standards set by the Chef. In addition, the Cook will assume a leadership role by directing other staff members in the absence of the Chef. They will ensure that sufficient quantities of quality menu items are prepared in a timely manner in accordance with the meal schedule. Some food service experience is preferred. We are willing to train someone with a positive attitude and good work ethic. If interested in applying for the position, please send resume to Chef Thomas. Assists in the preparation of foods by chopping, washing, cutting, assembling, and mixing food stuffs for cook; oversees line to make ceratin all items are replenished appropriately; washes and sanitizes dishes and utensils; cleans the dining area and replenishes napkins, utensils, and other necessities. Contact Chef Thomas for more information. 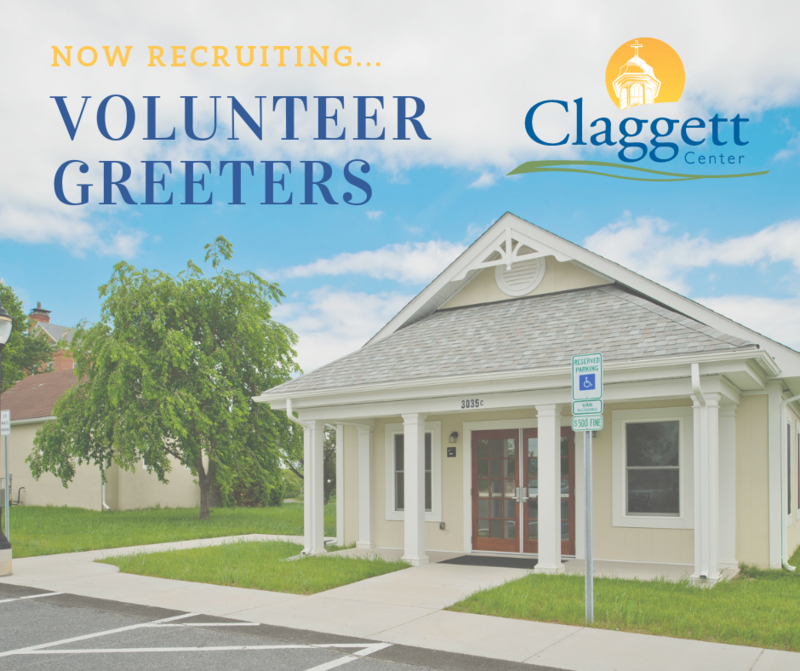 The Claggett Center is looking for individuals who are interested in meeting people, making new friends, sharing the hospitality of the Claggett Center, and enriching their life through volunteer experiences. Welcome visitors to the Claggett Center. Greet every individual with a smile and provide excellent customer service. Enhance customer relations by greeting and acknowledging guests. Be knowledgeable about the activities, programs, and services offered at the Claggett Center. Must have excellent interpersonal skills, a positive personality, and friendly demeanor. Must be able to approach and welcome all visitors and guests. Exceptional customer service experience is preferred. Shifts are available Monday-Friday between 8:30 a.m. and 4:30 p.m. Shifts are approximately 2-4 hours long depending on availability. If interested in becoming part of our team, please contact Suzi Warfield at 301-874-5147. We are now accepting applications for 2019 Summer Camp staff, including senior counselors, junior counselors, camp nurses, chaplains, and adult volunteers! Click here for more information. Summer Lifeguard positions will open soon!